McConnell-Linked PAC Attacks ‘Chemtrail Kelli’ Ahead of Trump RallyGOP infighting on full display. Trump Could Bust Loose Again at Phoenix RallyIt would be natural for the president to follow up on controlled remarks about Afghanistan with an uninhibited base-feeding frenzy the next night. Trump Cheers on Primary Challenge to Stalwart Supporter of His AgendaTrump’s endorsement of a primary challenge to Jeff Flake demonstrates, once again, that the mogul cares more about his ego than his agenda. Jeff Flake Draws Top-Tier Dem Challenger for 2018The Trump critic may be in for a fight next year. 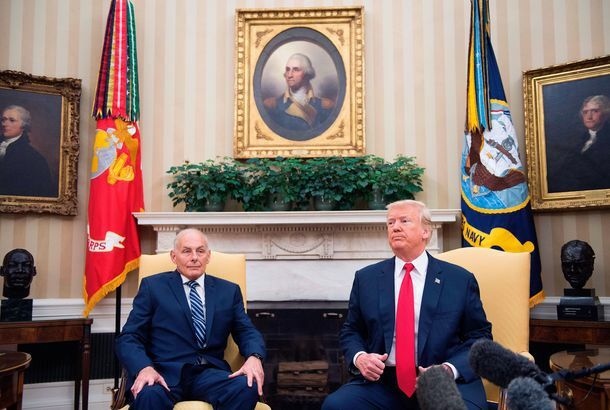 John Kelly Is Destined to FailThe retired general may have had early success in ousting Scaramucci and instilling some order. But this is Trump’s White House we’re talking about. Heller’s Hamlet Act on Health Care Bombing Back HomeFor a long time Dean Heller looked likely to thwart his party’s drive for health-care legislation. Then he flipped back, but the GOP failed anyway. Things Are Looking Up for Democratic Senators in Trump CountrySix Senate Democrats running for reelection in states easily carried by Trump last year are benefitting from strong popularity and GOP fecklessness. Teen Rips Into GOP Senator for Voting to Block Planned Parenthood Funds16-year-old Deja Foxx had some words for Arizona senator Jeff Flake. GOP Senator Wants to Let Your ISP Sell Your Info to Advertisers AgainAnother consumer protection could quickly get rolled back under the new Washington regime. Senator Jeff Flake’s Son Completes the Bigotry TrifectaGays, Jews, and black people. Jeff Flake Unseats Mitch McConnell As the Most Unpopular Senator in the CountryCongrats!